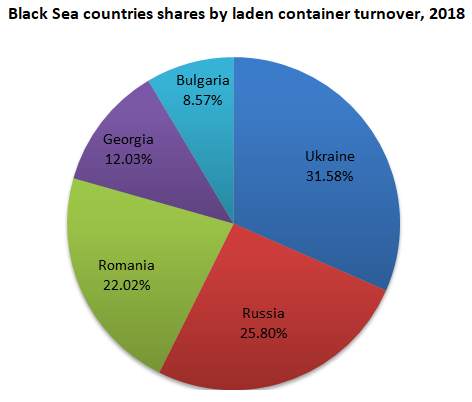 The record of market share growth (% of market share) in Black Sea belonged to Hapag Lloyd 2,78 p.p., ONE 1,42 p.p. and ZIM 0,81 p.p., while record of market share drop was shown by EVERGREEN -1,82 p.p., MAERSK -1,75 p.p. and ARKAS -1,14 p.p. Hapag Lloyd merged with UASC. HMM has suspended its activity at the Black Sea market. Carrier Place, Black Sea, 2018 Place, Black Sea, 2017 2018 share, Black Sea 2017 share, Black Sea Changes, p.p. Rating is based on the data on overall container turnover, without transshipment. The highest market share growth (% of market share) in Georgia was achieved by Hapag Lloyd 5,20 p.p., COSCO 3,45 p.p. and ONE 1,78 p.p. At the same time record of market share drop belonged to EMC -6,80 p.p., CMA CGM -1,30 p.p. and ZIM -0,86 p.p. Carrier Place, Georgia, 2018 Place, Georgia, 2017 2018 share, Georgia 2017 share, Georgia Changes, p.p. 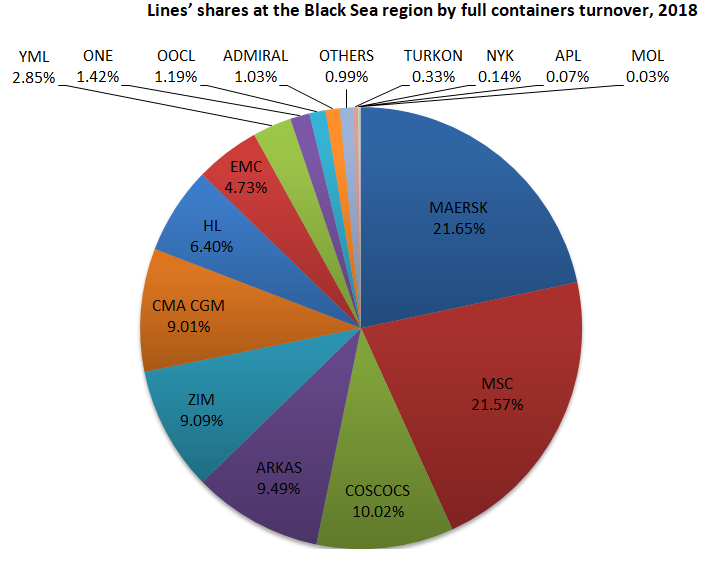 The record of market share growth (% of market share) in Bulgaria belonged to MAERSK 3,47 p.p., Hapag Lloyd 3,35 p.p. and ONE 2,21 p.p. At the same time the record of market share drop was shown by MSC -2,81 p.p., EMC -1,78 p.p. and ARKAS -1,40 p.p. Carrier Place, Bulgaria, 2018 Place, Bulgaria, 2017 2018 share, Bulgaria 2017 share, Bulgaria Changes, p.p. The record of market share growth (% of market share) in Romania belonged to Hapag Lloyd 1,92 p.p., MSC 1,55 p.p. and COSCO 0,81 p.p., while record of market share drop was shown by MAERSK -3,36 p.p., MOL -0,59 p.p. and ARKAS -0,49 p.p. Hapag Lloyd merged with UASC. NYK and MOL continued its presence in Romania under the brand of the united Japanese carrier – ONE. Carrier Place, Romania, 2018 Place, Romania, 2017 2018 share, Romania 2017 share, Romania Change, p.p. 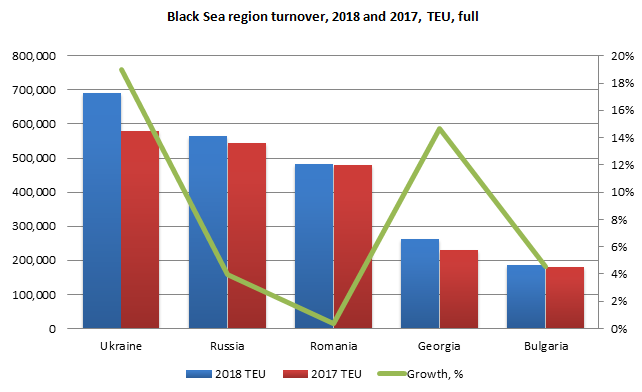 The record of market share growth (% of market share) in the Black Sea Russia belonged to Hapag Lloyd 2,10 p.p., MAERSK 2,08 p.p. and ONE 1,22 p.p., while record of market share drop was shown by MSC -1,66 p.p., EMC -1,65 p.p. and ARKAS -1,21 p.p. Carrier Place, Russia, 2018 Place, Russia, 2017 2018 share, Russia 2017 share, Russia Change, p.p. The record of market share growth (% of market share) in Ukraine belonged to ZIM 3,01 p.p., Hapag Lloyd 2,04 p.p. and COSCO 1,85 p.p. At the same time record of market share drop was shown by MAERSK -3,94 p.p., MSC -1,10 p.p. and CMA CGM -1,00 p.p. HMM has suspended its activity in Ukraine. 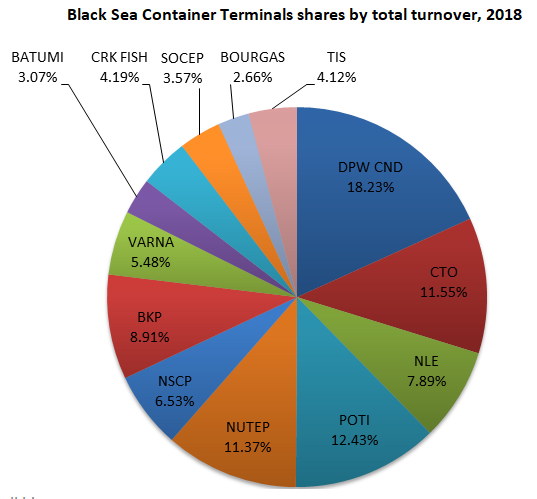 After merger between KLINE, NYK and MOL the united carrier – ONE, has started its activity in Ukraine since April and after 9m 2018 it had a market share of 1,68%. Carrier Place, Ukraine, 2017 Place, Ukraine, 2016 2017 share, Ukraine 2016 share, Ukraine Change, p.p.